In the name of god amen. The fift day of September anno Dni 1629 I Silvester Stutsberie of Winslow in the County of Bucks Draper being sick in bodie, but in good and p(er)fect remembrance (thanks be to god) do make this my last will & testament in maner and forme following: First I bequeath my soule unto Allmightie god, who hath created me, and redeemed me by his sone Jesus Christ by whose merites onely I trust to be saved, and my body to be decently buried in the Churchyard of Winslow. Item, concerning my worldly goods I give unto my sister Marian Stutsberie ten pounds, to be payd unto my overseers for hir use within one year after my decease. Item I give unto my sister Marie Stutsberie five pounds Item I give unto my sister Alice Stutsberie the sum(m)e of twenty pounds to be payed into the hands of my overseers for hir use Item I give unto my daughter Joan Stutsberie the sum(m)e of fiftie pounds, to be payed hir at the age of one and twenty years. Item I give to the poor of the parish of Winslow thirteen shillings and four pence to be distributed among them at my funerall. All the rest of my goods unbequeathed, my debts & legacies being payd, I give unto Anne my wife, whom I make my sole Executrix, And my loving friends Robert Bendbow and Henry Pym Overseers of this my last will & testament to see the same p(er)formed, And to either of them I give five shillings for their paynes. In witnesse whereof I have hereunto set my hand & seale the day & year first above written. 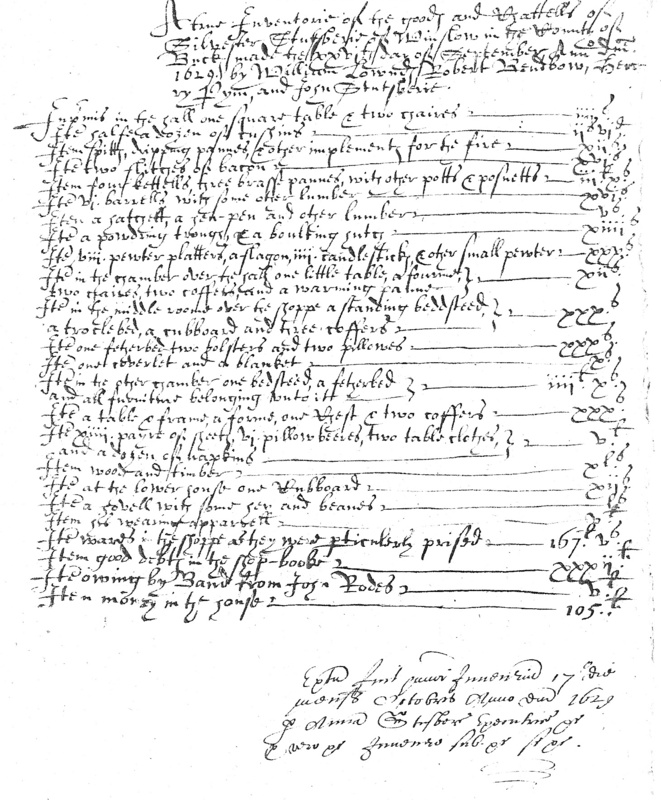 [translation] This inventory was presented on 17 October 1629 by Anne Stusberie, executrix etc., as a true etc. inventory under, etc., if, etc. Sylvester Stutsburie was buried at Winslow on 19 Sep 1629. Agnes (or Anne) Stutsberie his widow married Daniel Sayre (or Sear) in 1632. 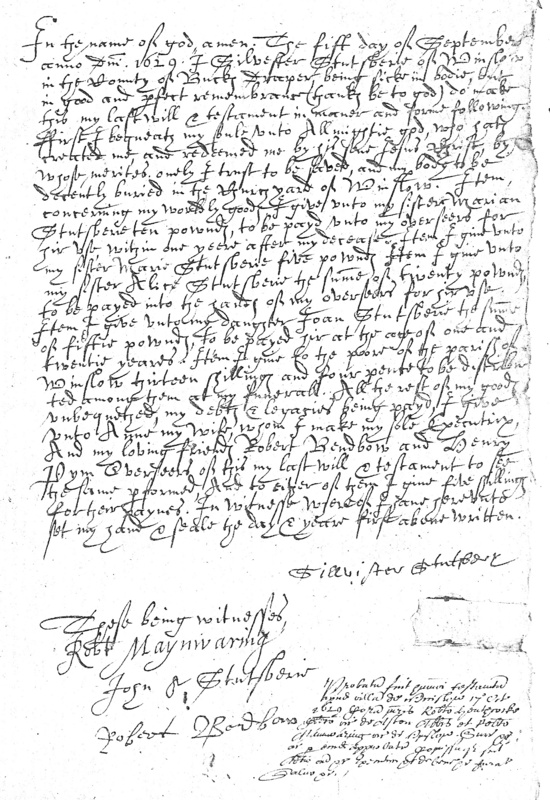 The marriage of Silvester Stutsberie and Agnes Graunt is recorded on 6 Feb 1624/5, and Silvester's daughter Joan was baptised on 11 Dec 1625. Joan married Henry Pym jr in 1641; they had a son called Silvester (1650-66). Silvester Stutsburie took over the draper's business from his father Richard, d.1624. According to the 1656 manor court, Silvester held a messuage, a cottage and 20 acres, which went to his widow Anne for her life. Troclebed: variation of truckle or trundle bed; a low bed running on castors, usually pushed beneath a high or standing bed when not in use (Buckinghamshire Probate Inventories 1661-1714, p.329). Pillowbeeres: variation of pillow beares; pillow cases or slips (Buckinghamshire Probate Inventories 1661-1714, p.326).